BP&G...Always Moving Forward with Expertise You Can Trust. Technology continues to evolve and we have something to put you on the map! 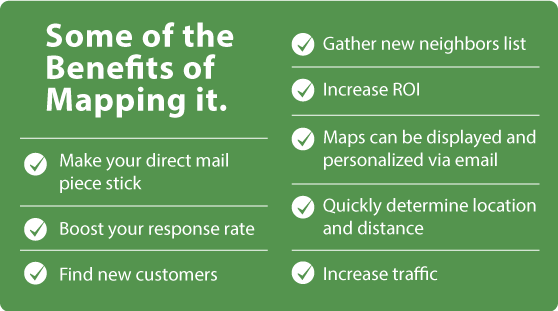 With Mapping Solutions, you are able to create highly targeted direct mail and email campaigns that drive customers to you! Adding personalized maps to your direct mail campaign creates a variable piece that resonates and stands out. Incorporating this tool into your email campaigns, allows you to achieve a convenient, interactive experience, which your customers will love! I would be delighted to explain and demonstrate how personalized maps can help you grow your business and expand your reach. Let’s talk soon. Personalized Direct Mail Pieces, and Emails, Allows Your Brand to Stand Out in the Mailbox & Inbox! Our goal is customer satisfaction and constant improvement. Call today for an absolutely free consultation and estimate. No job is too large or too small. The goal of Bennett Printing & Graphics is to deliver a quality printed piece quickly, accurately and at a competitive price. 2 color • 4 color • 6 color • 8 color • Special Effects and Coatings! Digital tags, signs, labels and MORE! A graphic artist conveys information through visual solutions that promote or enhance a service, product, philosophy or entity. Whether I am designing for the web, interactive or traditional print, my focus is always on quality! Ask about using ebooks to promote your product and business! Deer Crossing Tree Stands, Inc.
© 2009 - 2015 Bennett Printing & Graphics. All rights reserved.